After cruising through five easy games and winning Group C in the FIBA World Cup, USA will now prepare to take on Mexico in the Round of 16 on Saturday. The road thus far has been fairly smooth for the Americans, with one bump along the way in the first half of Game 2 against Turkey. Finding themselves right in the thick of things are Steph Curry and Klay Thompson, who have emerged as two of Mike Krzyzewski’s rotation staples in this tournament. They are two of six players on Team USA who have averaged over 20 MPG, with Klay only trailing Kyrie Irving in total minutes. Let’s take a closer look at how the Splash Brothers have fared so far. Throughout the summer, Klay Thompson was at the center of NBA trade rumors involving now Cleveland Cavaliers star Kevin Love. Always a tough experience for any professional athlete, Thompson must have been more than happy to turn his focus away from the media and just play ball. 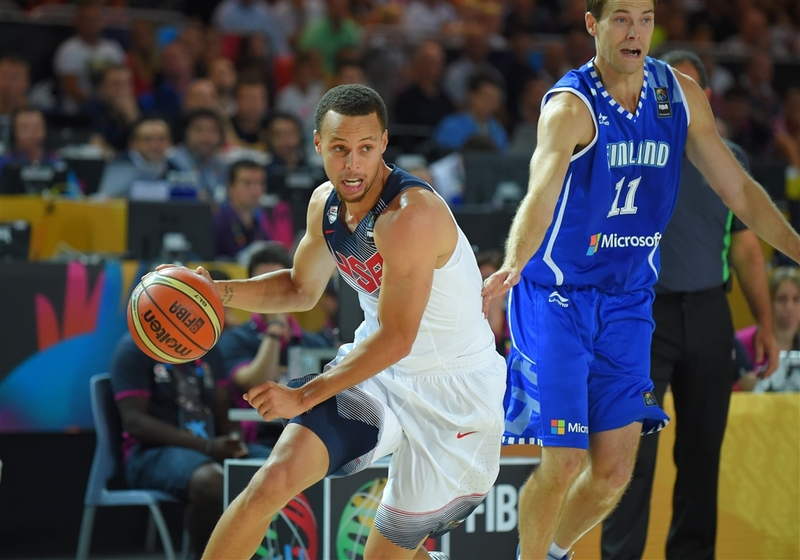 He showed everyone exactly why the Warriors refused to trade him in Game 1 against Finland. In an incredibly stacked lineup, leading Team USA in scoring in their first game of the tournament shows just how much Klay has already grown in his young career. He followed his 18-point breakout well throughout the rest of group play, averaging 10.2 PPG, good for fourth on the team. He has defined himself as the sixth man of this particular squad, leading all bench players in minutes and points. Klay has done exactly what is expected of him particularly well: space the floor, knock down jumpers, and play defense. In the final game of group play against Ukraine, Thompson did a little bit of everything as he scored 7 points, grabbed 5 boards, dished out 4 assists, and recorded 2 blocks to put together an outstanding all around box score. 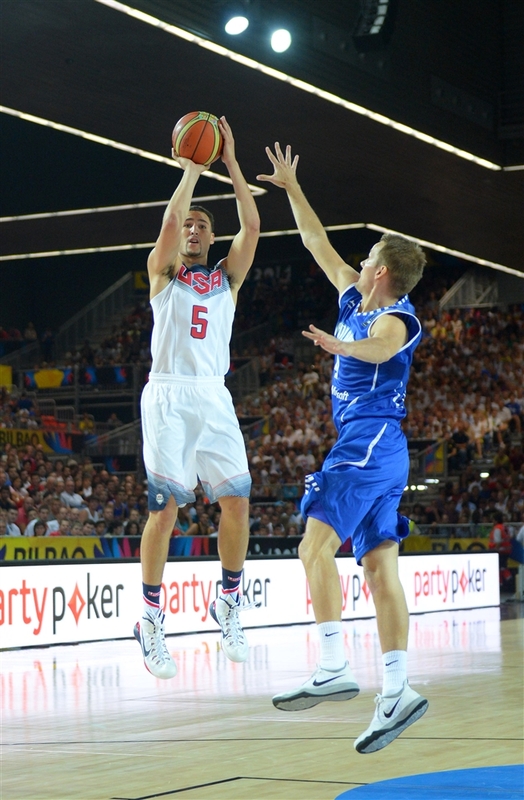 Making the final 12-man roster was a big achievement for Klay, but being one of Team USA’s key contributors through the first stage of the tournament speaks volumes. Many people have already noted how much pressure he will face next season due to the Kevin Love saga. Based on his play this past week, he looks more than ready for it. After a fairly disappointing first four games in the FIBA World Cup, Steph Curry was able to recover with a terrific game against Ukraine scoring 14 points and shooting the lights out like he usually does. 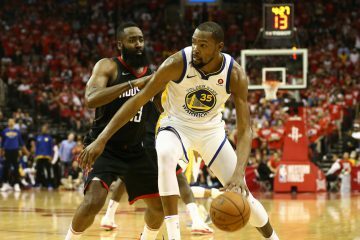 International basketball seems to be a perfect fit for the Warriors superstar with high paced offenses and a shortened three-point line. 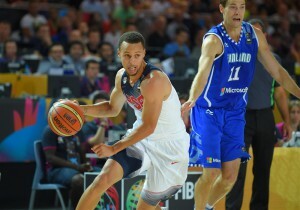 However, Curry struggled to keep up to his usual par to start out the tournament. He had some poor shooting performances including going 0-5 from downtown in Game 1 against Finland, and 3-11 overall in Game 2 versus Turkey. While he has pushed the ball well and assisted on some great alley oops to his athletic big men, he also at times has been a bit careless with the ball and turned the ball over 5 times in Game 3 against New Zealand. With so much talent surrounding him on Team USA and highly inferior players guarding him, it’s a surprise that Curry’s assist to turnover ratio has been lower (1.9) than it was in the 2013-2014 NBA regular season (2.2). Despite a few uncharacteristic performances, Coach K understands how vital Curry is to this team and his starting spot has never been in jeopardy. His standout game against Ukraine should help him gain momentum heading into the knockout stage. Look for Curry to improve game by game from here on out. While the FIBA World Cup may be meaningless to the casual basketball fan, this experience is going to go miles for the Splash Brothers. 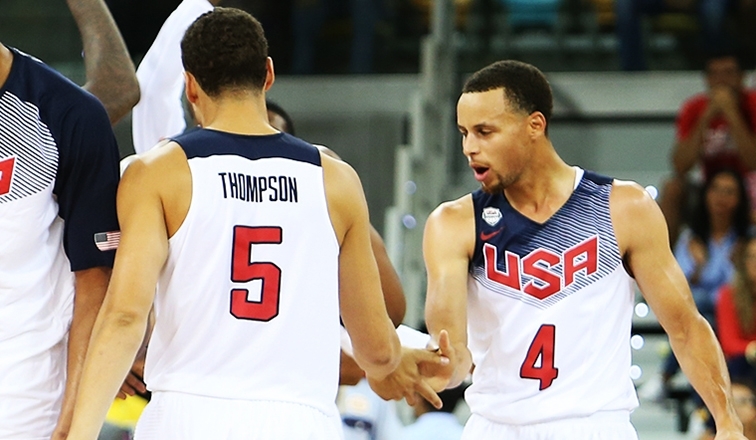 Playing major roles on Team USA and doing so side by side will give Curry and Thompson endless confidence as the Warriors begin training camp this fall. There is no doubt a sense of pride in wearing the red, white, and blue on their jerseys, but it’s quite possible that even more so than pride is a feeling of pressure. Any time USA Basketball has walked away from a major tournament without the gold medal hanging from their necks, it has ended in embarrassment. This experience is invaluable for Steph and Klay. 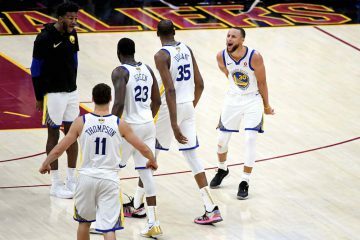 Embracing the pressure throughout the rest of the tournament and knowing the heat they would face with a loss, will pay its dividends when the Warriors look to make a deep playoff run next summer. If the final that everyone is both anticipating and hoping for happens, USA would face off against World Cup host Spain, who bears the three-headed frontcourt monster of the Gasol Brothers and Serge Ibaka. Anthony Davis and Kenneth Faried have been Team USA’s best players thus far, but with the great defense Spain has down low, you can expect the shooting of the Splash Brothers to be that much more important if the matchup does come to fruition. Regardless of the outcome in Barcelona, Steph and Klay will walk away from this off-season more together than ever. I haven’t been too impressed with their shot selection. 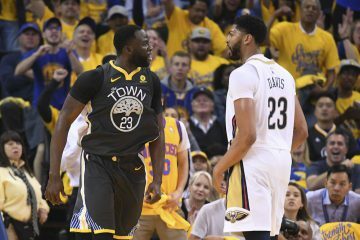 While Mark Jackson really help them gain confidence with their shooting ability, he didn’t really teach them, Klay especially, temperament with when to take the shot. Theyre sometimes a little too quick with the trigger, look at the Turkey game and Klays shooting a bit too much trying to bust the zone. 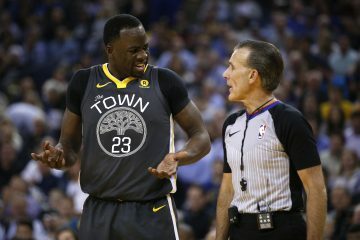 Whether or not that’s a product of the systemless free-reign style the US plays with or its something we’ll have to live with when you have the best shooting backcourt in the league remains to be seen under Kerr. Traditionally Steph starts an NBA season cold, and about a month later becomes the game’s best shooter. Assuming good health, this participation in the Worlds may mean that he begins the NBA season with his shot in mid-season form.